Zeno of Sidon was born in the city of Sidon on the Mediterranean coast of what today is Lebanon. Sidon was one of the oldest Phoenician cities and, from its founding in the 3rd millennium BC, was ruled by many different peoples: Assyria, Babylonia, Persia, Alexander the Great, the Seleucids of Syria, the Ptolemys of Egypt, and the Romans. If we were not troubled by our suspicions of the phenomena of the sky and about death, and also by our failure to grasp the limits of pain and desires, we should have no need of natural science. His criticisms of mathematics were very superficial of little importance since he clearly had very little understanding of the subject. In 306 BC he founded his School in Athens in the garden of his house. Reasonably enough the School became known as The Garden. Apollodorus, the writer of more than 400 books, was a prominent follower of Epicurus who lived in the 2nd century BC. Zeno of Sidon was a student of Apollodorus and he studied, and later taught, in the Garden in Athens. Cicero heard him teaching there in 79 BC. Zeno was a man of great learning who wrote on a very wide range of topics. It is believed that, among the areas he studied, he contributed to logic, atomic theory, biology, ethics, literary style, oratory, poetry, the theory of knowledge, and to mathematics. Except for the last mentioned two topics, we know very little about the contributions which he made. Here we shall discuss the only two areas to which Zeno contributed where details of his contributions are quite well known to us, namely the theory of knowledge and to mathematics. Although Epicurus, the founder of the School to which Zeno belonged, had no real mathematical abilities and criticised the subject from a position of ignorance, this is far from true of Zeno who had a deep understanding of the subject. Zeno made deep criticisms of the axioms that Euclid set out in The Elements. For example he claimed that Euclid's first proposition assumes that two straight lines can intersect in at most one point but Euclid does not have this as an axiom, nor can it be deduced from the other axioms. Zeno also attacked Euclid's proof of the equality of right angles on the grounds that it presupposes the existence of a right angle. Proclus also says that an Epicurean (almost certainly Zeno but Proclus does not name him) claimed that Euclid assumes that every curve is infinitely divisible, but again this cannot be deduced from the axioms. Some modern authors have suggested that these claims give Zeno of Sidon some justification to be considered as having been the first person to consider the possibility of non-Euclidean geometry. This is a little far fetched particularly since Zeno's aim was certainly not this. Rather his aim was to give substantial arguments against mathematics supporting the anti-mathematical beliefs of Epicurus. Zeno argued generally that, even if we admit the fundamental principles of geometry, the deductions from them cannot be proved without the admission of something else as well which has not been included in the said principles, and he intended by means of these criticisms to destroy the whole of geometry. Zeno's criticisms of Euclid are pertinent, however, and if any of the ancient philosophers and mathematicians who tried to refute them had been able to grasp their full implications, the development of mathematics might have taken a different turn. Many people gain an important position in history, or fail to gain such a position, as a result of luck. Had there been a mathematician following Zeno who could have continued to develop his ideas then we might know Zeno today as a major figure whose flash of mathematical genius changed the course of mathematics. This was not to be, however, and the brilliance of Zeno's ideas were not appreciated for many centuries. We know more of Zeno through one of his students Philodemus of Gadara. Philodemus studied under Zeno in Athens and then moved to Rome in 75 BC to work for the Roman aristocrat Lucius Calpurnius Piso. 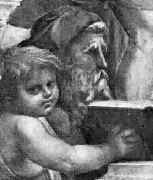 Philodemus then went to live in Lucius's villa at Herculaneum, near Naples, taking with him his considerable library of papyri. When Vesuvius erupted in 79 AD, Herculaneum together with Pompeii and Stabiae, was destroyed. Herculaneum was buried by a compact mass of material about 16 metres deep which preserved the city until excavations began in the 18th century. Special conditions of humidity of the ground conserved wood, cloth, food, and in particular Philodemus's papyri. In this dispute Zeno defended the old Epicurean doctrine that all human knowledge is derived exclusively from experience. What make it interesting, however, is that he bases his defence on a theory ... that is essentially an anticipation of John Stuart Mill's theory of induction. ... Zeno insisted that all knowledge is fundamentally derived by inference to all cases from a great many cases without observed counter-instance. Of course there are many examples in mathematics where Zeno's observations of many cases would actually suggest a false result.